Cal here. Before we talk stretch glass, I’d like to invite everyone to the Stretch Glass Convention, Show & Sale in Marietta, OH on July 27, 28 & 29, 2016. 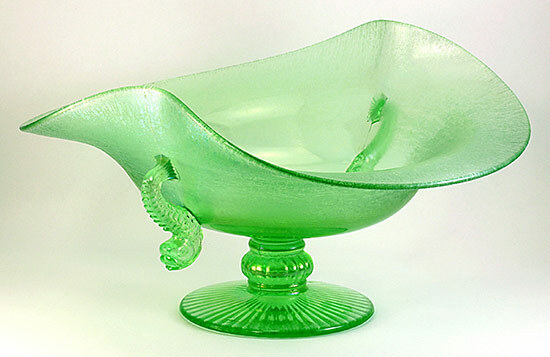 “Stretching Over 100 Years: A Century of Handmade Stretch Glass in America” will be our theme. Members will be creating displays depicting how they entertain with their stretch glass and our collaborative Club Display will feature 50 console sets (2 candleholders and a bowl and base). This will be mind-boggling! Stretch glass will also be offered for sale. 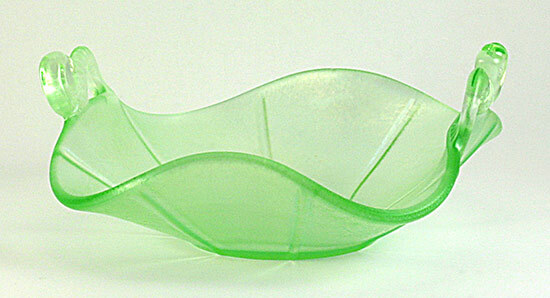 Registration information is on www.stretchglasssociety.org or can be obtained by email at info@stretchglasssociety.org. Ok, let’s finish up the Fenton dolphin discussion. We have looked at most of the vintage dolphin line except for the bowls, which are up tonight. As you might expect, Fenton had more than one bowl mould and came up with a number of ways to re-shape bowls made from each mould. Let’s look at the moulds they used and then we will look at some of the various shapes they produced. Fenton had moulds for 3 flat bowls, 1 footed bowl and 1 rose bowl. Some of the moulds included two dolphins, so these will be referred to as “twin-dolphin bowls” and others included three dolphins, so these bowls are typically referred to as “triple-dolphin bowls.” The smaller, flat bowl is the rarest of all. We see these without iridescence frequently and a few are known with a satin finish, but very few are known with any iridescence. These were designed to sit on the table or other surface, so there is no separate base for them. The larger, flat bowl and the rose bowl have identical bases and fit perfectly on Fenton’s 5-legged “Chinese” base. As you can see from the photos, adding one of these “Chinese” bases really enhances the bowl. These bowls will also fit on the standard flat Fenton base as well. The “dolphin-footed” bowls, of course, do not need a base. The small, flat bowl is made from the dolphin-handled bonbon mould and has a ground base. This bowl is only known in a square-crimped or oval shape. The square one is 6 3/8” wide, 1 1/2” high and the base is 2 1/2” wide. If you have one of these, consider yourself very, very lucky! Here is a picture of one of these twin-dolphin #1621 bowls. The most common flat bowls are triple-dolphin ones that were all designated as #1504 – A (with various shapes) while the other is the same triple-dolphin bowl, but with a diamond-optic interior (#1502 – A). 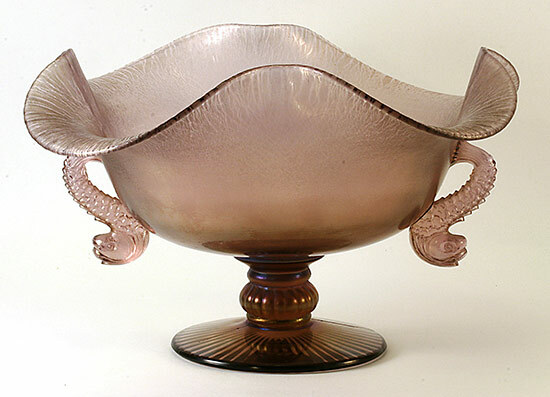 The low bowl is what we call the “ice cream bowl” shape, while others were flared, crimped or made into a rose-bowl form (see below). Let’s take a look at some of the bowls they made. Ok, let’s look at the footed bowls. All footed bowls originate from mould #1602. The top of the footed bowl was either flared, rolled, formed into a square, oval, crimped or formed into an oval with the ends pulled down (this form is referred to as the “helmet” or “deep oval” bowl). Since all of these have two dolphins, they are all “twin-dolphin” bowls. 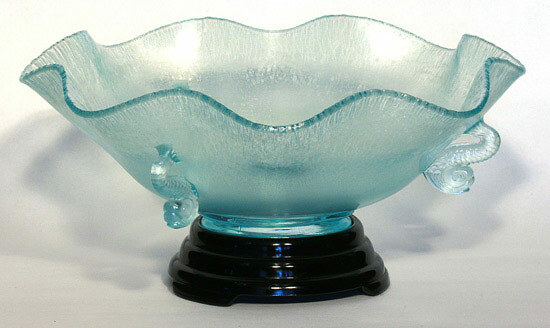 Flat and footed bowls are known in Aquamarine, Florentine Green, Velva Rose & Wisteria. Two triple-dolphin bowls are known in Amber, one is cupped and the other is flared. Both of these are considered rare. 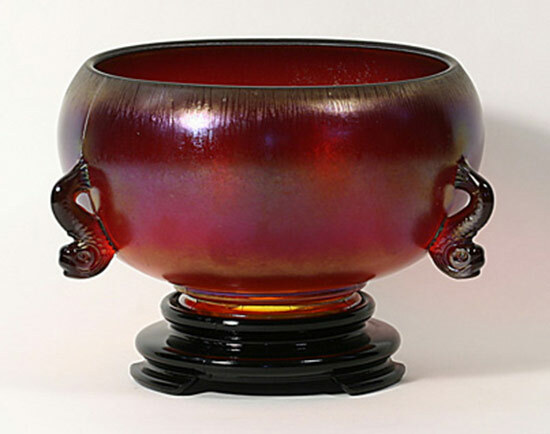 I’m not aware of any of the flat or footed bowls in Persian Pearl or Topaz (a couple of triple-dolphin rose bowls are known in Ruby) or any of the other Fenton colors – it would be fun to find one, so if you have one of which we are not aware, please let us know. Finally, let’s take a quick look at the rose bowl. 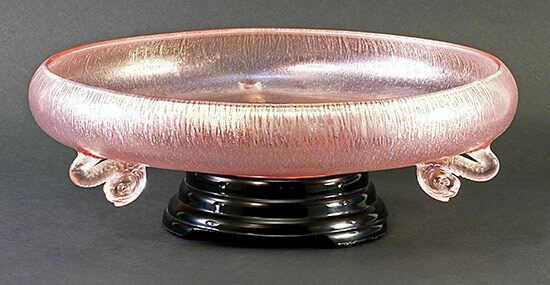 The triple-dolphin rose bowl is considered by many to be the “holy grail” in stretch glass. These bowls are quite rare; we are aware of fewer than 6 of the triple-dolphin rose bowls in Ruby and only 1 in Florentine Green. I think I saw one of these in Topaz but I have not been able to retrace my steps to find it, so it may just be a figment of my imagination. 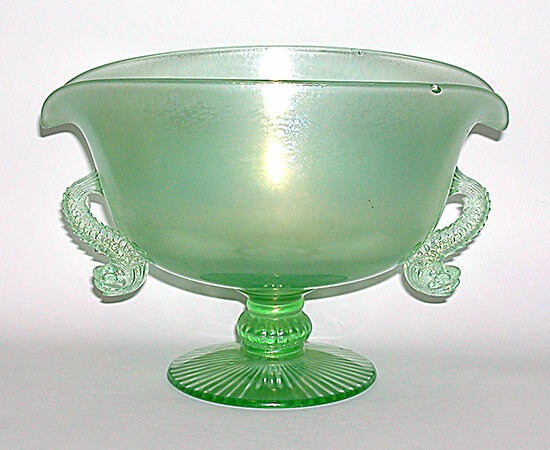 I would love to know if anyone has one of these bowls in any color – please send us a message if you have one. 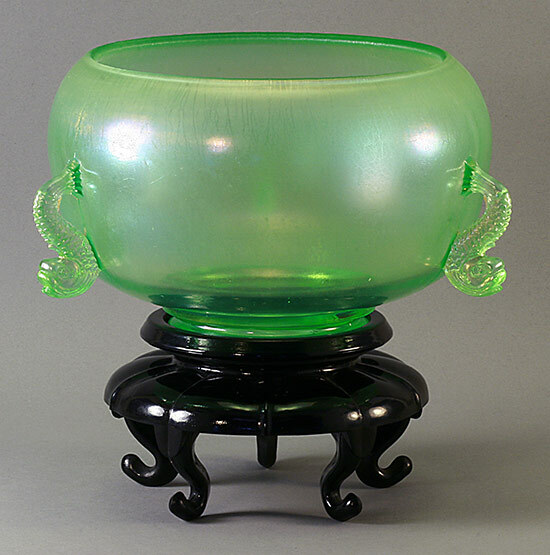 That wraps up our discussion of Fenton vintage dolphin stretch glass. 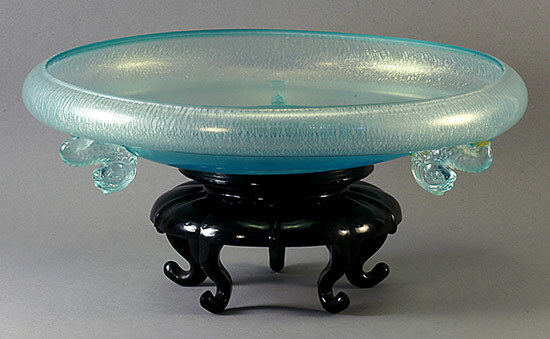 Some dolphin items were made during the contemporary stretch glass period (1994-2010), but they were not “reproductions” of the older pieces as they were not made in the same colors and, in most cases, the forms or sizes were different from the vintage items. Most contemporary dolphin pieces are also marked with the Fenton logo. I’ll talk about them another time and comment on the differences between the older and newer dolphins.